With the holiday season getting into full effect we are starting to see all types of family movie fare out in these theaters. This week we have some counter-programming for the folks who don’t want to see a magic Johnny Depp face magic Doctor Who. We have the Mark Wahlberg and Rose Byrne-headlined Instant Family. This movie is by Sean Anders, who co-wrote and directed based partially on his own personal life. The movie opens with Wahlberg’s Pete and Byrne’s Ellie showing Ellie’s sister around a torn down home they intend to flip and resell. During their talk, it leads them to think about having a family but instead of doing it the old-fashioned way the married couple decides to look into adoption. They end up going through the process of becoming Foster Parents and then taking a liking to a snarky 15-year-old girl named Lizzie (Isabella Moner) who they then find out is a package deal with her two young siblings. From there, hijinks ensue along with slapstick all over the place. I think what stands out in this is just how full of heart is in this. All the comedy and drama comes from a very heartfelt place. Pete and Ellie are really earnest in this, some real go-getters that have their hearts in the right place but get overwhelmed quickly, which leads to a ton of comedy in Wahlberg and Byrne's performances. They do feel like characters they have played before. Byrne’s Ellie does feel a bit like her character from those Neighbors movies and Wahlberg is playing the good guy, like he does in Ted, rather than the tough guy. It doesn’t get boring because the kid actors are great. The younger actors are great in selling that right amount of cuteness and showing how parenting can go from 0 to 100 real quick. Isabella comes into this with previous performing chemistry with Walhberg from that last super-terrible transformers movie, The Last Knight. She’s able to bring all the teenage angst the couple needs to deal with on screen and be completely bewildered through most of the movie. All the other co-stars come in and play their role for the right hits for laughs with Tig Notaro and Octavia Spencer being one of the standouts as a great comedy duo of two social workers who help people become foster parents. Spencer gets all the great lines while Notaro is a fantastic dry straight-woman. 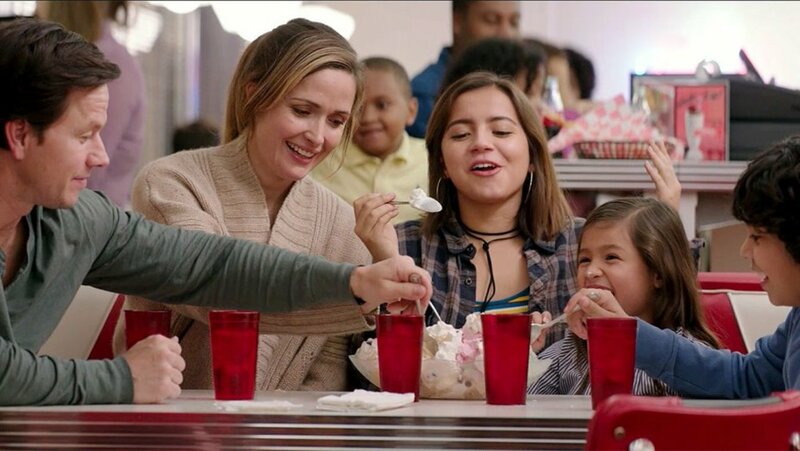 Despite laughs from the occasional baseball to the face and bad shopping experiences, Instant Family really is selling adoption's best virtues, which is a good thing we don't often see in movies. There are a ton of movies that have terrible product placement or overbearing messages guilting the viewer into something. While this does feel like it is pushing this issue on us, it does so lightly and very entertainingly. With that, it makes it really enjoyable, worth watching and funny enough for repeat viewing. It’s not an instant classic but it is good for a family.